Many large retailers sell refurbished items. Usually, refurbished refers to electronics, like computers, television sets, or smartphones. Stores like Best Buy, Wal-Mart, and Office Depot routinely sell refurbished electronics and consumers are happy to pay the discounted price for an item that isn't brand spanking new. But is it too risky to buy these types of items on eBay, when you can't see the item first and verify it works properly? What Does Seller Refurbished Mean? When an item is seller refurbished, it means that it isn't brand new. It could have been damaged somewhere along the way during manufacturing or shipping. The refurbished product performs exactly the same as a brand new one, but it is sold at a lower price because it is refurbished. That's called factory refurbished. Seller refurbished is when a seller may take a broken or item, or an item with parts that don't work properly, and repair it, then sell it in good working condition. 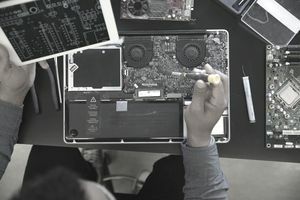 A good example is a computer repair shop that buys non-working, broken, or junk computers from customers, repairs them, and resells them. The computer technician may also list these items on eBay. Or, in many cases, instead of having a brick and mortar store, the computer expert only sells online. The most obvious benefit of purchasing refurbished items is the price. If the seller refurbished item is a popular name brand like Apple, buying refurbished is a great way to be able to afford the leading brand but without the high cost. The Apple Store actually sells refurbished items as a way to appeal to a different market segment who do not want to pay for or cannot afford a brand new computer. Refurbished electronics often come with a warranty, just like a brand new item. Warranties can range from one to three years. Warranties usually cover not only parts but labor and maintenance. But purchasing from a retail location such as an Apple store is very different from purchasing a computer or other electronic device on eBay, sight unseen. Unfortunately, eBay is known for scams. (Well, so is Craigslist and other online venues, so eBay isn't alone in this.) The best defense against a scam on eBay is a good offense. Make sure to take steps to protect yourself so that you are not a victim of a scam. Check the seller's eBay account history. When was their account opened? Is it brand new? If so, do not buy from them. A good rule of thumb is that the seller needs to have been selling for at least a year. Check the seller's feedback. How many sales have they had, what kinds of items did they sell, what were the prices, and what are other buyers saying about them? Consider all of these factors when buying from a seller on eBay. Check what kind of items the seller has for sale. Do they specialize in electronics or refurbished items? Or do they sell a mixture of all kinds of random items? It is best to choose a seller who specializes in refurbished items because they will be more knowledgeable and more experienced within their niche. Check the seller's DSR rating. This is their Detailed Seller Rating and is a combination of several factors that indicate a seller's track record, such as shipping time, communication, shipping cost, and item as described. Seller refurbished items can be a great way to get a brand name item at a much lower cost. Just make sure to do your homework before buying refurbished items on eBay. If you do get stuck with a dud. remember eBay's Guarantee, "Get the item you ordered or your money back." And if paying with Paypal, you can file a dispute up to 180 days after the purchase date. eBay's Guarantee is only good for 30 days.